Uncategorized Archives - Crowe Tree Service Inc.
Spring is on it’s way and this is a great time of year to start thinking about your trees, hedges and tree maintenance. This time of year is great to look at our trees to identify any care you may need to start applying to your young trees in the spring. One of the first things you will want to take a look at is whether or not you need more mulch. Check around your young trees and determine the level of mulch that has survived through the winter months. 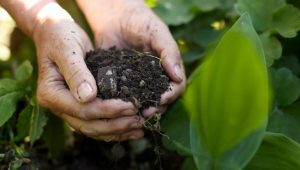 It’s best to dig around the existing mulch checking for any weeds or other issues before putting another 2-3 inches of mulch on top that would just mask the deeper problem. Once you have checked the surrounding mulch and determined that everything looks good and you need more mulch then you are good to go with puttting another 2-3 inches on top. 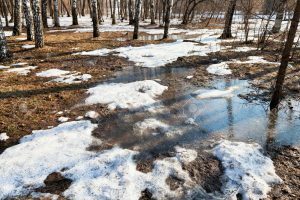 The next thing you will want to do is check the water level of your trees with a screw driver to see if the screw driver comes out wet or moist when put into the ground. Your trees have been pushing roots all winter and are likely thirsty so it’s a great time to give them a proper drink. 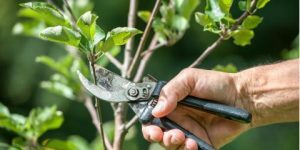 After nourishing your parched trees and replenishing the mulch it is time to start looking at pruning the trees to foster optimal growth and to trim the dead ends. For the best spring tree maintenance, give us a call and one of our trained arborists in Ottawa will help you with your spring tree maintenance. Your trees will be healthier for it and your yard will look fantastic. Trees can really add to a landscape and beautify your yard, so when they are dying it can be hard to part with them. Even if your tree seems healthy and in good shape, the health of your tree could be much worse than what you see with the untrained eye and can be a disaster waiting to happen if something isn’t done right away. Usually removal of a tree would be a last resort if there are no other options such as safe tree management like pruning and disease mitigation however there are times where tree removal is the best course of action a home owner can take. Tree removal in Ottawa can be tricky business and quite dangerous so it is highly recommended to have a professional tree removal expert perform the tree removal. You should not attempt to do a tree removal on your own unless you have a lot of experience with tree removal and tree maintenance. 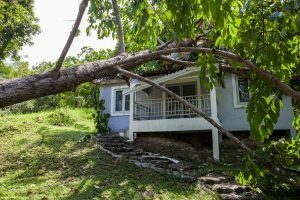 If you do not remove a dead or dying tree then you are risking thousands of dollars in damage as well as personal injury if the tree or parts of the tree fall. With the heavy winds and unusual weather we have been experiencing in Ottawa, it is recommended to have us take a look at your trees if there are some you are concerned about in order to assess the risk and provide you with some recommendations. Often a tree doesn’t look dangerous until after a storm or heavy snow exposes its vulnerabilities and by this time it may be too late if the tree has fallen causing damage to property or persons. 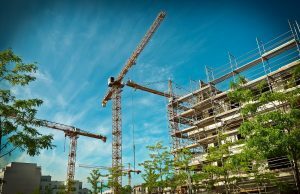 As a home owner, you own the tree and therefore you are responsible for any damages caused by the tree so it is in your best interest to have the tree professionally removed. This is just to keep you informed and not to scare you as the tree removal process is easy and affordable. We just want to make sure you understand the reasons behind having a tree removed and the seriousness of not removing a dead or dying tree. If you have noticed any of these red flags then give us a call and one of our professional arborists will come by to inspect your tree to determine a tree maintenance plan or if tree removal is required. If your tree is dead or dying it doesn’t mean it has to be removed in every case. For example, if your tree is located on a large lot in a forest away from people or structures then it will be okay to let nature take its course. Tree removal is usually a last resort because these trees can serve as a home and refuge for woodpeckers and other wildlife in your neighbourhood. 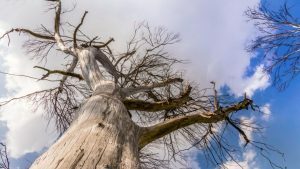 Sometimes tree failures happen and it is sudden and something you cannot plan for – however with dead and dying trees you usually have some time before imminent danger is present so you can prepare for a proper tree removal by a professional. This is not to be ignored though to prevent damage to yourself, your family or your home. A good time to inspect your tree is in between seasons before the worst of summer storms and heavy winter snowfalls happen. Since most tree removal jobs are unsafe for the average home or property owner, it is important for you to give us a call for our professional tree removal services. Cedar hedges are a relatively simple way of providing privacy to your home compound and yard. These are easy to grow plants that also add a formal lovely look to your landscape. They are evergreen providing an all year color and interest. 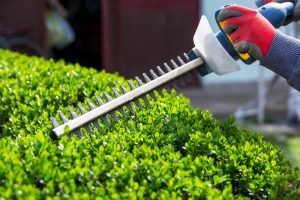 However, they also require maintenance and pruning to keep them looking neat and sharp. In Ottawa, there are quite a number of species of cedar trees which can be used for hedges. The most common species of cedar wood in Thuja occidentals which is commonly called American arborvitae, Northern white cedar, Eastern arborvitae or Eastern white cedar. You must be very cautious while selecting where you place your cedar hedge. These non-dwarf plants can reach heights of about 15 feet for the Thuja occidentals and 60 feet for Sudwelli if not properly maintained and pruned. Avoid placing the cedar hedge close to a path, like a walkway or a roadway where you will use salt during the winter. This is because of salt damages cedar hedges. The other don’t is you should avoid planting cedar hedges near steep slopes that cause loss of moisture. For the best growth, it is key to plant your cedar hedge receives full sun to part shade. These plants prefer to be planted on organically rich soil which helps maintain the moisture. It is important to place the plants 12 to 18 inches apart from each other when planting. Mature cedar hedges need to be fertilized every fall or spring. For the first year, the cedar hedges do not require pruning as they are only under 3 feet tall. As the hedge matures it will serve you well if you begin pruning in early spring. The shortest plant will act as a guide, trimming off the tops to match it and light trims on the sides. If the goal was to encourage more height the leader which is the topmost should not be trimmed. It can also be pruned lightly to encourage more height. Pruning of cedar hedges in Ottawa goes on throughout the summer to prevent the winterkill of freshly pruned branches. Cedar hedges are quite the best boundary plants as they do not have any serious insect or disease problems and the effect of infestation is usually minimal. Cedar hedges should be pruned during spring or fall and all through the summer to keep them neat giving your yard that formal look. The right machinery for grinding tree stumps is efficient in its work and key to avoiding injury during the work. Homeowners frequently use chainsaws hoping that they will work out, unfortunately, the chainsaw is the last tool for this kind of job. Tree trimming done by professionals uses a wide variety of power tools and large machinery. Hiring this equipment is expensive and using the wrong tools is a dangerous choice, the best option is hiring a professional for tree removal in Ottawa. 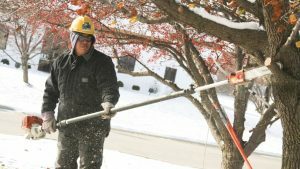 The most obvious challenge faced during tree trimming or tree grinding is safety. One needs to protect their eyes, ears, hands, and body from the debris and tree pulp that is being ground. Tree removal Ottawa has professionals well equipped to keep themselves safe and others around them. Professionals are well trained to deal with the wooden stumps, difficult and dangerous targets without compromising their safety. When removing a tree stump, there are several factors to consider because they are incredibly thick and resolute. These factors include: when is the job finished? and at what point is the stump successfully ground? 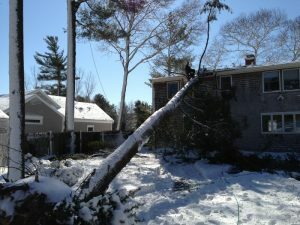 Professionals performing tree stump removal and tree trimming know the answers to these and other pertinent questions. 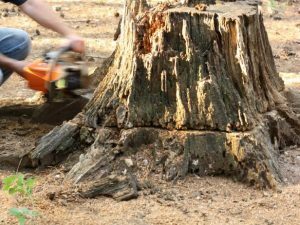 Hiring a well-trained professional for tree stump removal is the best way to approach this issue because professionals know how to approach the job and know when the removal is safely completed. Professionals also know how to clean up the residue after tree stump removal. It is not advisable to attempt to remove a stump on your own or attempt to grind dead trees alone. This may lead to serious injuries to yourself and others or damage to the surrounding property. Hiring a professional ensures you get the best service done correctly and safely with zero risks and value for money.